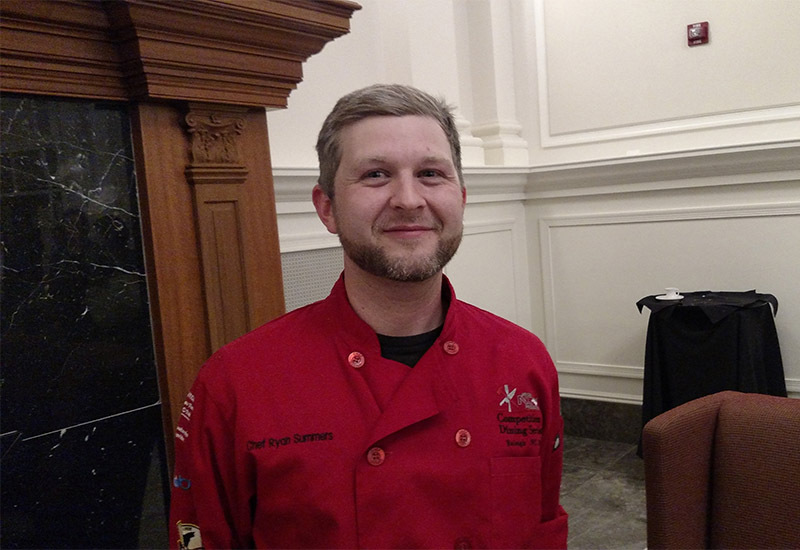 Cary, NC – After a competition that came down to tenths of a point, Cary chef Ryan Summers and his team won their first match of the Battle of Champions and are now one more match away from being the state champions. Summers of Chef’s Palette Restaurant and Bar in Cary was a member of winning Team Mirepoix. 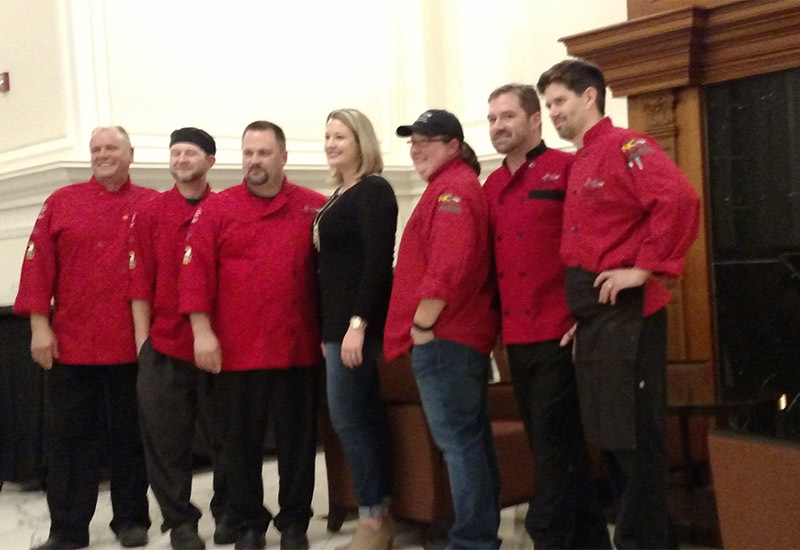 It includes team leader Franz Propst from Peak City Grill and Bar in Apex and Tom Halik from Main Street Grille Café and Bakery in Wake Forest. Team Mirepoix made it to the Battle of Champions because they won the Raleigh leg of the Competition Dining Series back in July. 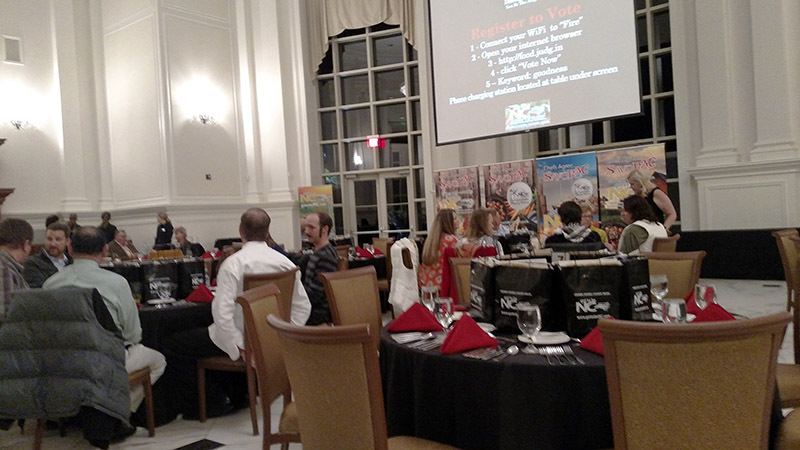 The Competition Dining Series is a collaborative effort with the state’s “Got To Be NC” initiative to promote local food and all dishes not only included local ingredients but promoted the farmers and producers for certain components. As regional champions, Summers and Team Mirepoix qualified for the Battle of Champions, pitting them against the other champions from across North Carolina. Because Raleigh and Charlotte were the largest of the six statewide divisions, the winner of their Sunday, November 13, 2016 competition went straight to the finals. Team Mirepoix beat the Radical Range Riders from the Charlotte division and will face the other finalists on Sunday, November 20, 2016. When Summers talked about his planning ahead of the Battle of Champions, he said he believed the Radical Range Riders would be their stiffest competition because they had the highest scores of any division, save for Raleigh’s. At the competition, all diners are judges, with some professional chefs and food distributors given more weighted points. There were six dishes in total, three from each team and all evaluated separately. Every dish had to include two featured ingredients: white sweet potatoes from Scott Farms and yogurt from Carolina Farmhouse Dairy. Also, as a secret for the chefs, they were later told that at least one of their three dishes had to include sorghum syrup molasses from Harnell Hill Farms. Because it was a competition, both positives and negatives will be included in these descriptions but individually, these were all the best tasting plates many of us could ever hope to eat. 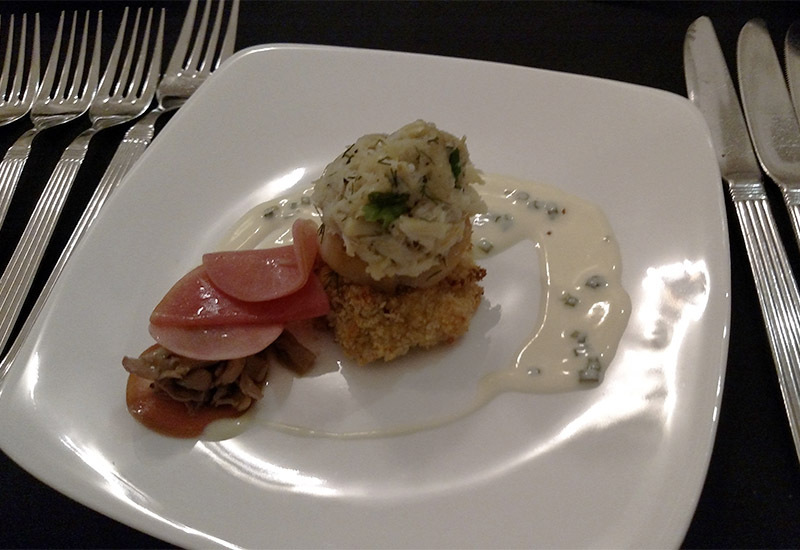 The first dish was NC lump crab and smoked scallop salad, yogurt and chive sabayon, white sweet potatoes and Lady Edison Country ham croquettes. This dish had a very strong, smokey fish taste that went well with the sour sabayon sauce and vegetables that went with it. However, the taste of the potatoes and the yogurt was largely lost. The second dish was a white sweet potato and yogurt gnocchi with NC shrimp and pancetta, NC baby arugula, NC baby yellow squash and a brown butter sage sauce with fried sage. The gnocchi was soft and brought out the flavor of both of the local featured ingredients very well. 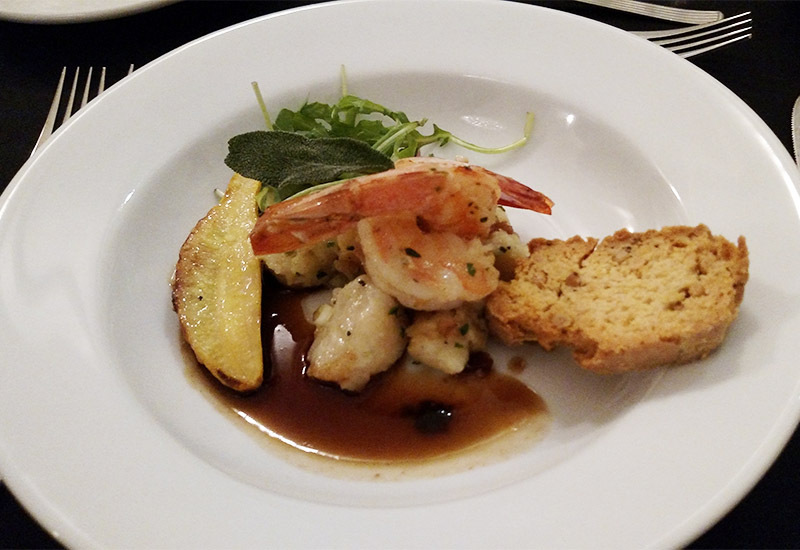 The shrimp had a good, rich taste and were cooked with the right amount of give and the sauce paired well with all of the sides, although there could have been more of it, especially with the piece of bread that came with the dish not doing much without it. The third dish was Perry Lowe apple cider and sorghum syrup molasses braised pork belly, curried white sweet potato and yogurt purée, kabocha squash and root vegetable hash, NC turnip green and pumpkin seed pesto and crispy mushrooms. As you can see, I got a little too excited with this one and ate it before I could take a picture. But the curried potato was terrific, especially when the other ingredient were mixed in and the pesto had a surprisingly bright taste. On top, the pork belly was very fatty, as it normally is, and the cider and syrup did not add enough sweetness to balance it out. 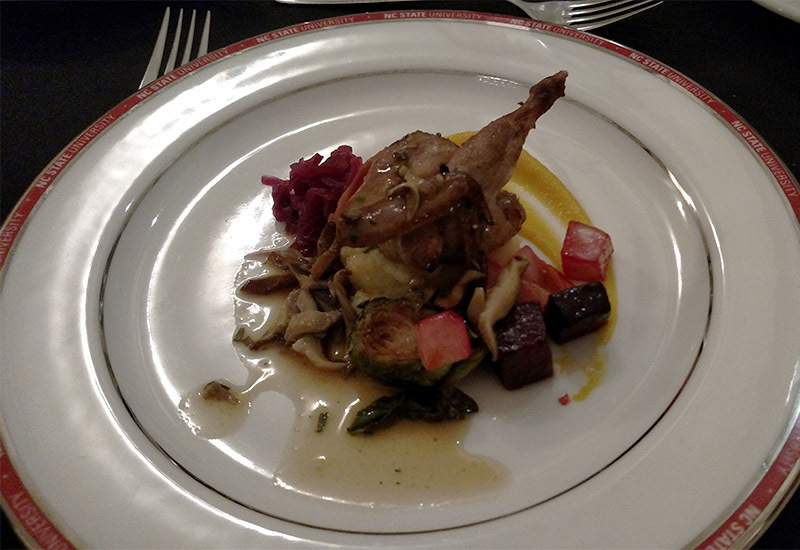 The fourth dish was marinated and roasted quail with herbs, wild mushroom au jus, mashed white sweet potatoes with yogurt, roasted autumn vegetables, pickled rainbow radish and red cabbage and butternut squash purée. The purée was dynamite and had a sweet and substantive taste while pairing well with the other vegetables on the plate and the mashed white sweet potato. Sometimes the larger chunks of vegetables had a harder time matching with the food but the pickled ones gave a nice sour taste. The quail on top had a nice juicy taste but it did not particularly stand out. The fifth dish brought on dessert with High Rock Farm chestnut flour, almond and cherry frangipane, Perry Lowe apple brandy currant compote, cinnamon-ginger white sweet potato ice cream, lace cookie with cloister orange blossom honey and yogurt foam and NC perisimmon gel. There was a lot to enjoy on this plate and it all had a very Autumnal spiced taste. With the foam, this was the best clear taste of the delicious yogurt and each individual component of the dessert was sweet and spiced and wonderful. 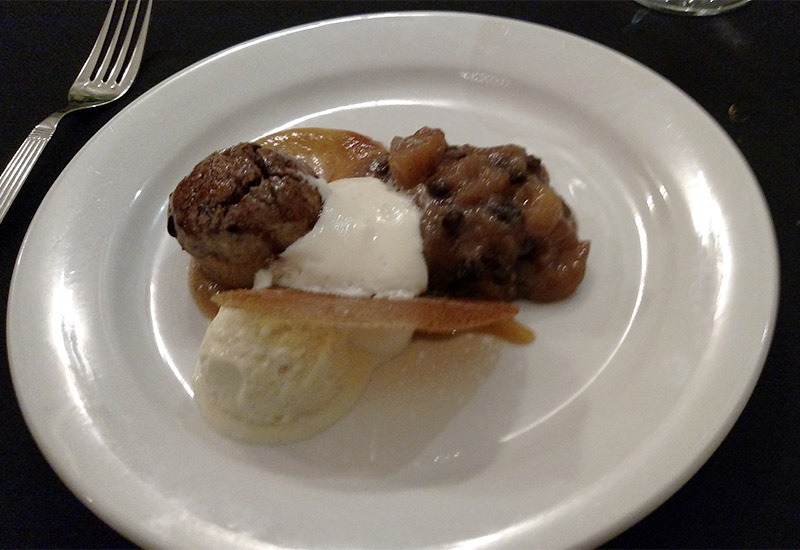 The only criticisms were that it felt like three or four separate desserts instead of a cohesive dish and the sweet potato taste was lost on me in the ice cream. 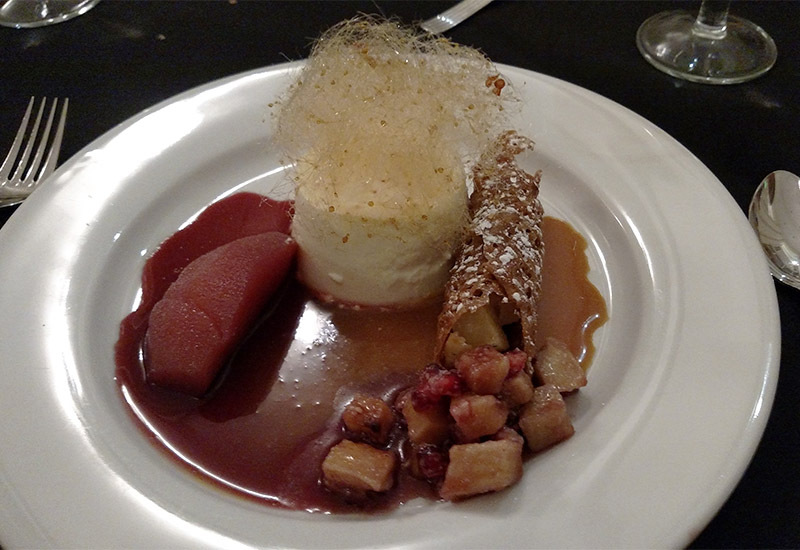 The sixth and final dish was yogurt and vanilla bavarian cream, red wine poached pear, cherry and caramel sauce, caramelized white sweet potato and pomegranate wrapped in a walnut cornucopia and angel hair spun sugar. The pear had a lot of crisp and sweet flavors and the sauce paired well with not only that pear but every component of the dish. Everything could be combined in a number of ways, although the walnut cornucopia was very heavy and slowed down the meal. With the potatoes, I got a clear taste of the ingredient but there was not as much of that in the yogurt. The spun sugar was creative but it was coarse to eat at times because it was so stiff and sharp. With their victory, Summers and Team Mirepoix will go up against either the Greensboro or Winston-Salem team, who compete on Friday, November 18, 2016, in the finals to determine the state champion. Tickets are still available for that final match. The Battle of Champions takes place at the Dorothy and Ray Park Alumni Center in Raleigh. Chef’s Palette is located on 3460 Ten Ten Rd. in Cary. Story and photos by Michael Papich. Coverage on CaryCitizen is sponsored in part by Thai Spices & Sushi in Cary.